A little (very little) bit of free exposure to some musicians that I saw on Saturday in Grand Central. Its the Dagmar Duo. Just a man and woman set of singers. But, I’m a sucker for a female singer who wears fairy wings. The rest of her getup was also a bit eclectic and retro; but the wings won me over. I was only there for part of a song as I had places to go. 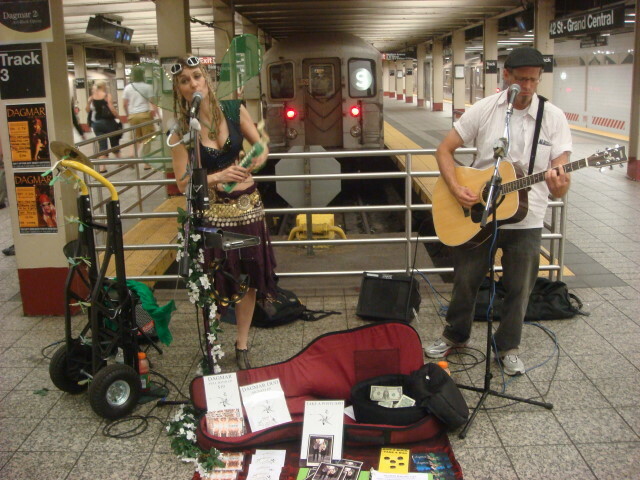 They were good; but then again most performers in the subway system are quite good. One of the primary reasons I put them in a post is that I seem to see fewer and fewer performers. They are all approved by the subway system, but I seem to just see a smaller number of them. In Times Square, their primary spot has been taken over by a little music kiosk so they can’t perform there. In Grand Central, the usual performance area just inside the subway entrance seems empty almost every time I go in there. My observation isn’t systemic, though. I walk to work and I only use the subway over the weekends. This entry was posted on August 3, 2008 at 1:38 pm and is filed under Events, Manhattan, Mid-town, Wanderings. You can subscribe via RSS 2.0 feed to this post's comments. You can comment below, or link to this permanent URL from your own site.